Rudraksha is one powerful scared object that possesses the power of positive influence and made with such qualities are FlowerAura’s Rudraksha Rakhis for your brother that can bless him with a greater peace of mind and can pave the path for success effortlessly. Rudraksha is a natural seed, found within the vibrant blue fruit of the evergreen Elaeocarpus Ganitrus. The name significantly means "the tears of Shiva". Indigenous to the Himalayas, these are found in abundance. It is said while contemplating Man's suffering, Shiva began to cry tears of compassion. And as his tears fell, he guided them towards Earth and transformed them into seeds. These seeds, thus can change the karma of the wearer and transform lives into happier ones. Often used by saints and yogis since ancient times, these have now become a part of Indian festivities and cultural occasions. As a pious amulet, these beads are stringed into religious malas, small piece of jewelry and recently, these have made their way into Rakhis. A Rudraksha Rakhi for a brother or a Bhabi can work wonders for them. As these can simply bring the luck charm right on to their wrists and remove obstacles from their path of success, Rudraksha Rakhis have become the prominent choice among a majority of sisters. Now, you must be wondering about going to the Himalayas to buy a Rudraksha Rakhi for your brother? Well, you don't have to. Because FlowerAura, India's leading gifting online portal is all set to shower a world of Shiva's auspiciousness by availing Rudraksha Rakhi online. Each of these is embellished with compassion, strength, and vital energies that are proved to bless the wearer with health benefits. And along with sacredness, each of these is handcrafted with beautiful other stones, gems, and precious colored threads that can garner every sister, a world full of appreciation. While each of these is available at your fingertips, you can send Rakhi to Gurgaon, Pune, Delhi and send your wishes of well being to your brother in a whole new way. Rudraksha Rakhi is only Rakhi that comes with a dual purpose. One, these create powerful protection circles that help the wearer to reach greater heights and caters to increase their potential. Second, these are intricately designed with other colored stones, gems, vibrant beads that make them a fancy bracelet too. Thus, with every FlowerAura's Rudraksha Rakhi, you give your brother a gift of protection and fashion, both at the same time. All you need to do is browse through a wide variety of rakhi for brother and make your selection. 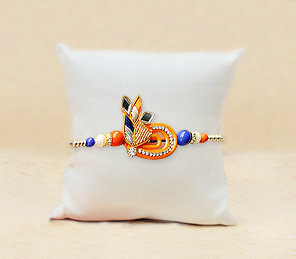 The Rakhi section in FlowerAura's online store is brimming with infinite options from which you can make your order from. Once you make your selection, FlowerAura's prompt services will cater to send rakhis to your brother and hand-deliver your warm wishes right away. You and your brother have spent years together but unfortunately, this year, you are away from him. He has gone to some other city in pursuit of his dreams while your marriage life has made you cross borders too. But Hey, you don't need to be sad, if you and your brother can't celebrate together this year. Yes, with FlowerAura, your Rakhi is going to take a new turn. Known to bring relations closer and provide gifts for the moments that can't be put into words, FlowerAura's all types of Rakhi including Rudraksha Rakhi can be sent to anywhere and everywhere in India. These Rakhis are just a few clicks away and FlowerAurA's exclusive services and features can help you send each of these as per your accordance, i.e, you get to choose your date, time bracket, and also, the opportunity to couple them with other Rakhi gifts such as dry fruits, flowers, cakes, best brother mugs, personalized cushions, innovative lamps, chocolates, and many more. So, what's with the wait? Visit FlowerAura's online store and turn your occasion into a celebration with India's leading florist, FlowerAura.